My A to Z Challenge theme is rather broad – anything to do with my writing practice really; be it the peaks, troughs or simply the things which have made a difference. Today I want to extol the virtues of having a cat and the effect it has had on my writing! Last October after much deliberation, I decided to buy a kitten (Polly). I would have got one much earlier but for the fact that I live in a top floor flat with no garden access and I wasn’t sure whether it would be cruel to keep a cat indoors. Anyway, I went ahead in the end and have no regrets whatsoever. Having Polly has grounded me, fulfilled (in part!) my maternal instincts and also helped immensely with my writing. Before I got her I socialised a lot and spent few evenings at home, and yet I continued to have this aching feeling that I needed to be in solitude as I wanted to develop my writing. I suppose by going out so much, I was running away from what I now feel I was born to do, partly out of fear that I wasn’t good enough and so I’d be wasting my time, and also because I recognised the amount of work involved, and wasn’t sure whether I was up to it. Now, however; I no longer feel that way. When I see Polly sitting all Zen-like on her kitten tree, it makes me want to slow down and spend time with her. Now I like nothing better than to open my laptop and get going on a short story, piece of flash or blog post, with her snoozing nearby. My way of life has changed significantly over the last few months and even though I’ll never stop socialising, my priorities are definitely different now, and Polly has helped a great deal. Nice post for the A to Z Challenge, cat perfect, especially when you can get so much enjoyment from them. I wish I could take a cat now! You ate right, cats are inspiring creatures, no matter how you look at them. The have the wisdom of the Universe in their eyes. She’s usually inspiring but right now is miaowing her little head off, so a bit annoying!! Thanks for reading, Rian. 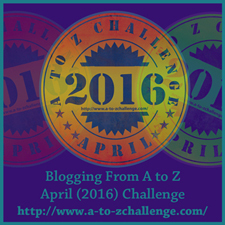 Are you doing the A-Z challenge too? Yes, most humans are rubbish! Do you have any pets, Mark? pets have a way of doing that. Love the name Polly! Enjoy the serenity!